GRAND-BASSAM, Ivory Coast (AP) — Armed men attacked an Ivory Coast beach resort Sunday, killing at least 16 people and sending tourists fleeing through the historic town of Grand-Bassam in an attack claimed by al-Qaida's North Africa branch. Bloody bodies were sprawled on the beach and witnesses described horrific scenes as a lazy weekend afternoon was shattered by the West Africa's latest extremist strike. 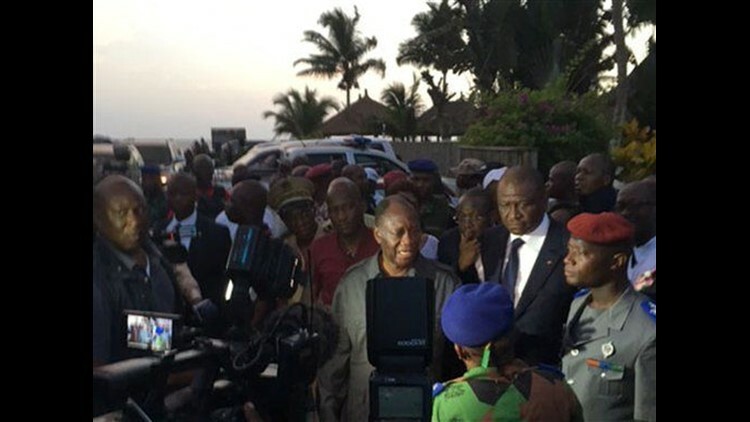 Ivory Coast's President Alassane Ouattara told reporters at the scene that 14 civilians, two special forces and six assailants were killed when the gunmen stormed the beach. The president arrived in Grand-Bassam a few hours after the attack, visiting the hotels and saluting security forces for their quick response. Al-Qaida in the Islamic Maghreb claimed responsibility for the attack, according to SITE Intelligence Group which monitors jihadist websites. The Islamic extremist group made the declaration in a post to its Telegram channels, calling three of the attackers "heroes" for the assault. The bursts of gunfire sent people running from the beach at Grand-Bassam, a UNESCO World Heritage site and popular destination for Ivorians and foreigners about 40 kilometers (25 miles) east of Abidjan, Ivory Coast's commercial center. It was the third major attack on a tourism center in West Africa since November. Some witnesses said the assailants fired at random, while others said the killing was more targeted. Witness Marcel Guy said that gunmen raced across the beach in small groups, toting Kalashnikov rifles and hunting for victims. An Associated Press reporter saw four bodies sprawled out on the beach in front of a small resort next to the Etoile du Sud hotel, which is popular with foreigners. Jacques Able, who identified himself as the owner of Etoile du Sud, said he rushed to the hotel after getting a phone call. He said one person had been killed at the hotel. A receptionist at the Etoile du Sud described the mayhem. "We don't know where they came from, and we don't know where they've gone," said the receptionist, who would not give his name. Beachgoers could be seen lining up with their hands above their heads as they filed out of the area. Residents who heard the gunfire hid in their homes, said Josiane Sekongo, 25, who lives across from one of the town's beachfront hotels. An American embassy delegation was in Grand-Bassam on Sunday, but the U.S. Embassy in Abidjan said it was monitoring the situation and had no evidence U.S. citizens were targeted or harmed. Dozens of people were killed in the earlier attacks on West African tourist sites, starting with a siege at a Malian hotel in November and then an assault on a hotel and cafe in Burkina Faso in January. Analysts have warned for months that Ivory Coast, which shares a border with both of those affected countries, could be hit by jihadists as well. All three West African countries are former French colonies and at least one of those killed in Grand-Bassam Sunday was French. The Paris prosecutor's office has opened an investigation into the attack, calling it murder in connection with a terrorist enterprise. Anti-terrorism investigators will handle the probe because there was a French victim. The West African attacks indicate that extremist violence is spreading from North Africa, where a beach attack in June killed 38 people in Tunisia. "I have always said that Abidjan (Ivory Coast) and Dakar (Senegal) are the next targets for jihadist groups because these two countries represent windows of France in Africa," said Lemine Ould M. Salem, an expert on al-Qaida in the Islamic Maghreb and author of a book "The Bin Laden of the Sahara." The United States strongly condemned the attack in Grand-Bassam, sending "thoughts and prayers to all affected by this senseless violence." The U.S. Embassy in Abidjan is making every effort to account for the welfare of American citizens in the area, said the statement issued by State Department spokesman John Kirby. Ivory Coast is an important regional partner to the United States, said the statement. "In the days ahead we stand ready to support the Ivorian government as it investigates this heinous attack," said the statement. British Prime Minister David Cameron said Sunday he was "appalled" by the attack in Grand-Bassam as well as a bombing in Turkey's capital that also occurred Sunday.